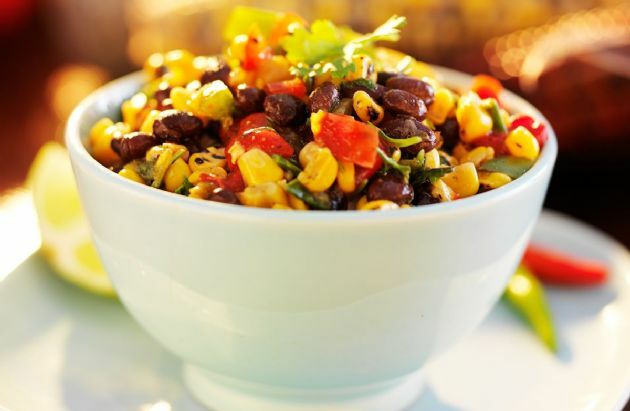 This corn and black bean salsa is the perfect dish for potlucks when you want to have something healthy on the table. This corn and black bean salsa is the perfect dish for potlucks when you want to have something healthy on the table. Open can of black beans, place in strainer and rinse off excess "juice". dump in bowl. open can of corn, place in strainer to drain off excess water, then dump in bowl with beans. Open can of rotel and add to beans and corn. Add onions and cilantro and stir. Add lime juice to your taste. I bring this to every potluck, and everyone LOVES it. It can be eaten as a "salad" like cole slaw, or with corn chips. Rotel is a brand name of tomatoes spiced w/ green chiles... comes in mild and hot. Rotel is a brand name, like Dole or Green Giant. is the rotel spicy hot?